Well, it's about that time. In a few hours it'll be November and NaNoWriMo officially begins. 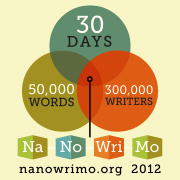 I've done NaNo for the past two years and was able to hit the word count each time. This year I don't know if I'm going to be able to do it. For one thing, I'm working full time now, which I wasn't doing the past couple of years. The other thing is I really have no huge story idea to write about. Plus, I want to finish editing my current story. I don't know if it's considered cheating, but I think starting tomorrow I'll take whatever words I add during my editing process and consider them part of my NaNo word count. That way, maybe it'll keep me motivated to finish editing. Then I have a couple of ideas for stories that are non-publishable that I was thinking of doing. Just to write something. Anyway, if you're doing NaNo and you want to be writing buddies, here's my information: K_S_S.